That was the quote Sara Shepard used at the beginning of The Lying Game. Seems so simple, but yet is extremely complicated once you think about it. I’m sure once I get past the 3rd chapter I will gain insight into how it relates to the book, but for now I’ve been thinking about how it relates to some of my favorite television characters. In the majority of the television shows I watch there have been people pretending to be someone they aren’t. Some of them are pretending to get revenge, others for love. But whatever the reason, their actions are beginning to have dire consequences. Since I watch a lot of TV, let’s begin at the beginning. Just about everyone in Storybrook is pretending to be someone they’re not, except they don’t know it. The two who are in the know aren’t in any danger. They are who they pretend to be. The one person who has now adopted a new persona is Snow. She is so in love with Charming that even though his SB alter is married, she has given in to an affair that she knows is wrong. Now the virtuous school teacher has become an adulteress. If Regina is to be believed, Mary Margaret was never truly as white as snow as people believed. Are her current actions a glimpse of the person Regina hates, or is she just a fool in love who has thrown caution to the wind? Only time will tell, but I’d like to believe she just succumbed to her desires. Snow isn’t the only character who is in denial. Ever since Aidan killed his maker in the first season of Being Human, he has tried to destroy the vampire regime from within. Unfortunately, while he has pretended to be one of them, he has allowed himself to be sucked in. Aidan has been so desperate to regain his humanity that he has blinded himself to the dangers around him. While pretending to still be the vampire he once was, he has fallen off the wagon, and let his blood lust consume him. Getting revenge on the vampires of his past while becoming more like them will create even more problems for Aidan, and most likely, his friends. Amanda Clarke knows all about the dangers of becoming the person you are pretending to be. She adopted the persona of Emily Thorne to get revenge against the people who destroyed her life, and ruined her father’s legacy. While scheming, partying, and burning down houses, Emily has fallen for the son of her greatest nemesis, Daniel. Thinking she’d use him in her plot, she discovered he wasn’t the man she originally believed him to be. Now she is faced with a dilemma. How can she take down the parties responsible for her father’s imprisonment, and death while holding on to the man she’s grown to love? Since the other man she loves has already become collateral damage, the odds aren’t in her favor. 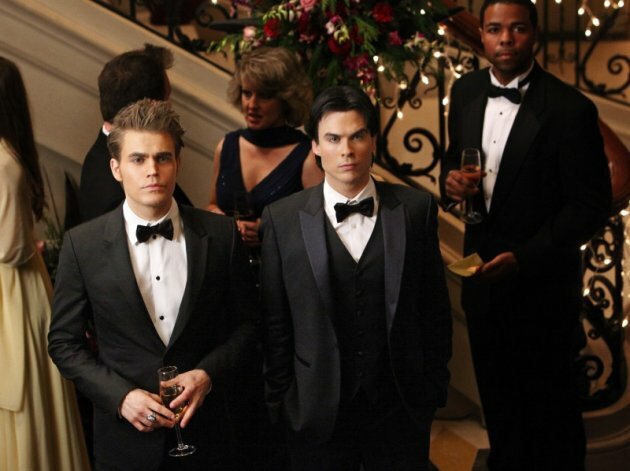 The residents of Mystic Falls are hardly ever what they seem at first glance, but the people who are in the most danger of believing their hype are the Salvatore Brothers. Stefan and Damon are damaged in som many ways, that I doubt even they know who they truly are. Stefan was always looked upon as being the “good son” by their father. He walked on sunshine. When he became a vampire he felt free for the first time. No longer did he have to fit into the mold his father made for him. After years of tearing things up, the guilt set in, and (with some help) he was set on the right path. He struggles to be “good”, but there is darkness in him. Unfortunately, he was always led to believe that giving in to it would be “bad.” Mostly because his brother, Damon, was used as an example. While Stefan was held as the “good” son, Damon was always looked upon as being the “bad” seed. He never seemed to do anything right, and was always compared to his brother. After Damon saw how bad Stefan became once they turned into vampires, Damon wanted nothing to do with that life. Sure Damon was reckless and impulsive, but was he truly bad? Doubtful, but the need to fit the mold has driven him to play his part. This season we have seen that the boys have more than one side to them, and are actually more alike then they may have originally seemed. They have lived so long in the roles their father assigned, that they can’t seem to shake the labels. But the Salvatore brothers aren’t the only brothers who are stuck in their assigned roles. 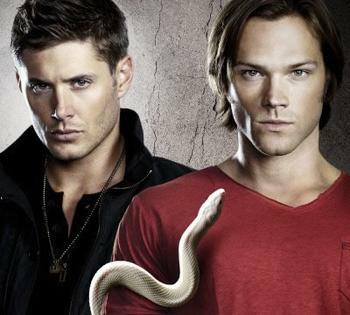 The Winchester boys have been to hell and back (literally), but as the end is nigh (again) they are struggling to hold on. No one more so than Dean. Dean has been through a lot, but the death of Bobby seems to have knocked him over the edge. He won’t admit it, but he’s hanging on for dear life. What I love most is how they are finally addressing Dean’s alcoholism. He was always a drinker, but if you watch closely you’ll notice how it’s increased with every season, and now you have to count the times he’s actually sober. Alaric Saltzman has nothing on this man. Even though Sam doesn’t seem to be as affected by their loss as much as Dean, I’m sure his facade will begin to crack by season finale time. He already is “envisioning” Satan. What else will he begin to see? Keep in mind that I fell asleep during last night’s episode, so I may have missed the answer to that question. So many characters are pretending to be someone they aren’t to gain something they believe to be necessary. The longer they wear the mask, the more likely they will end up becoming the thing they pretended to be. In the end the consequences they face will more than likely prove that the only one the ever deceived was themselves.